Although the lampworking technique can be employed to create other forms of glass art as well as scientific laboratory equipment and neon signs, my focus in using it is to make beads. I love beads. In fact, I have a fantasy of one day rolling around in a huge tub of beads...like a kid in a pile of leaves! 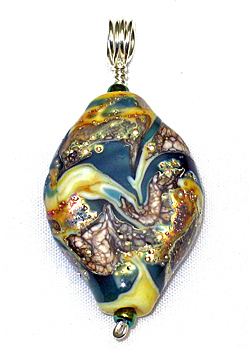 lampwork beads are handmade using the ancient technique of melting glass and wrapping it around a steel rod. The term "lampwork" originated in 17th century France and Italy when oil lamps and blowpipes provided the heat. Today this technique is also called torch working or flame working because torches (most commonly fueled by tanks of propane and oxygen) are used. The basic technique, however, is largely unchanged. The two photos in this section show a bead being formed. The torch flame is pointed away from me. In my left hand is the stainless steel rod, called a mandrel, which has been dipped in bead release (a clay-like material) which allows the bead to be removed from the mandrel after it is finished and cooled. The rod of glass in my right hand is being heated until it is molten at which point it is wrapped around the mandrel as the mandrel is slowly rotated. It is the mandrel that, when removed, forms the hole in the bead. Once the basic bead is formed, what can happen next is limited only by the imagination. I utilize numerous techniques for decorating, manipulating, and shaping the still molten glass. 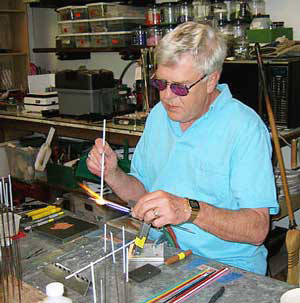 When melting colorful glass rods in a flame to make a jewelry bead, I start with an idea and then I play, allowing the molten glass to guide me. Wherever that "playing" leads me, the resulting bead is entirely hand formed using simple tools. I continue to resist using the molds and stamps that are available that ensure exactness in size and shape. The result is a bead that is more organic and lacking the appearance of having been machine made. The completed bead is then placed in a computerized, temperature controlled kiln and allowed to slowly cool from about 1000 degrees Fahrenheit to room temperature; a process that takes five to six hours. The controlled cooling ensures that the bead is carefully annealed (tempered) for maximum strength and durability.